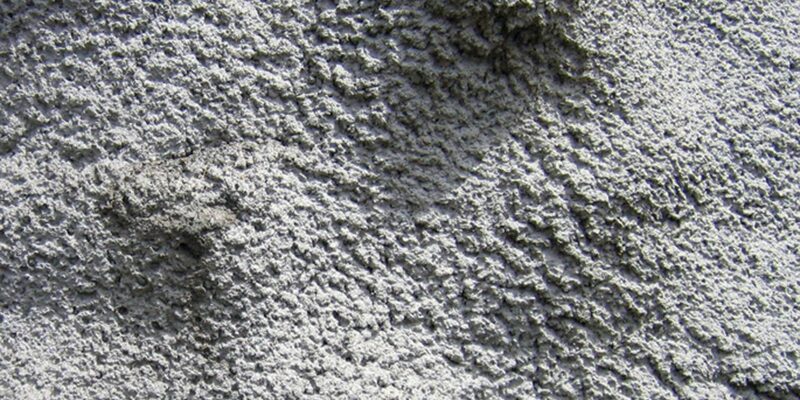 An eco-friendly alternative to Portland cement, fly ash can be used to create stronger, greener buildings. In 2009, the concrete industry used about 15 million tons of coal ash. Fly ash, a byproduct of coal combustion, has been used for decades as a concrete additive. It is considered an eco-friendly alternative to portland cement, adding strength and workability to concrete. That designation was jeopardized 2009 when the EPA threatened to classify it as a hazardous material. Any discussion of fly ash must begin with America’s coal industry. U.S. coal mines produce about one billion tons of coal annually, 90% of which is used domestically in coal-fired power plants. A portion of the ash generated is so fine that it rises with the smoke and historically was allowed to escape into the atmosphere. Today, pollution laws require utilities to capture this fly ash and dispose of it in an environmentally responsible way. In 2008, a dam holding back coal ash slurry burst in Kingston Tenn. The spill led to calls for better storage and handling of the material, and prompted the EPA to re-evaluate its classification. Fly ash is properly classified as a “supplementary cementitious material” (SCM), part of the family of pozzolans that reacts with cement and water to create a paste that binds the sand, gravel, and other aggregate into a monolithic solid. More precisely, fly ash reacts with calcium hydroxide to form calcium silica hydrate, the substance that actually makes concrete hard. It allows the mix designer to substitute fly ash—available from the power plants—for costly portland cement, and produce an end product of equal or greater strength. The concrete companies got a larger profit, the contractor a more workable mix, and the owner a stronger concrete, all while reducing the environmental impact. With that ruling, the market escalated rapidly. The EPA joined with several other agencies and private partners to create the “Coal Combustion Product Partnership” promoting the use of fly ash and other residuals. According to Adams, use of coal byproducts increased from 29% in 2001 to 44% in 2008, even as the raw tonnage of coal burned was increasing significantly. In that year, 136 million tons of fly ash were generated, and nearly half was being diverted from landfills for beneficial reuse. By far the largest consumer was the concrete industry. 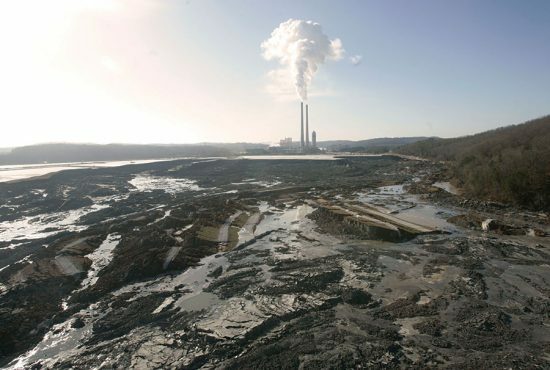 This was all thrown into turmoil when disaster struck at Kingston, Tenn. A coal-fired power plant there had been storing fly ash onsite for years. To make handling easier and keep dust down, water was added to the coal ash to create a slurry, which was stored in enormous artificial ponds. In 2008, three days before Christmas, one of the retaining dams burst, and 5.3 million cubic yards of coal ash slurry flooded across the valley, burying roads, choking rivers, and knocking several homes off their foundations. Fortunately no lives were lost, but 300 acres were buried in sludge. The spill prompted a discussion about how EPA could prevent a similar event. But unless a product is classified as hazardous, the EPA is extremely limited in what it can do. The consensus was that the EPA needed to declare the material a hazardous waste. However, coal ash has never been particularly dangerous, and even the EPA made it clear that they only wanted to address to the disposal side of the equation, not the reuse/recycling aspect. Understandably, though, consumers were spooked. The EPA, which had promoted fly ash concrete as green and environmentally responsible, was suddenly threatening to declare it hazardous. They shuttered the coal byproduct promotion group. 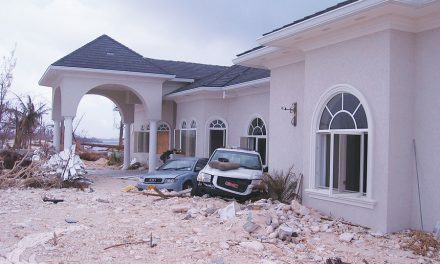 Homeowners who had planned to use fly ash concrete were suddenly wary of putting it in their homes. Depending on the ready mix producer, fly ash is handled in a number of ways. Some batch plants simply purchase “blended cements,” available from major suppliers like LaFarge, Holcim, Cemex, and Ash Grove. These products provide a high degree of consistency, but are limited to the varieties the cement producer has stocked. Most ready-mix plants prefer to buy pure fly ash directly from the suppliers. Stored in segregated silos at the batch plant, they can create virtually any mix design right at the facility. 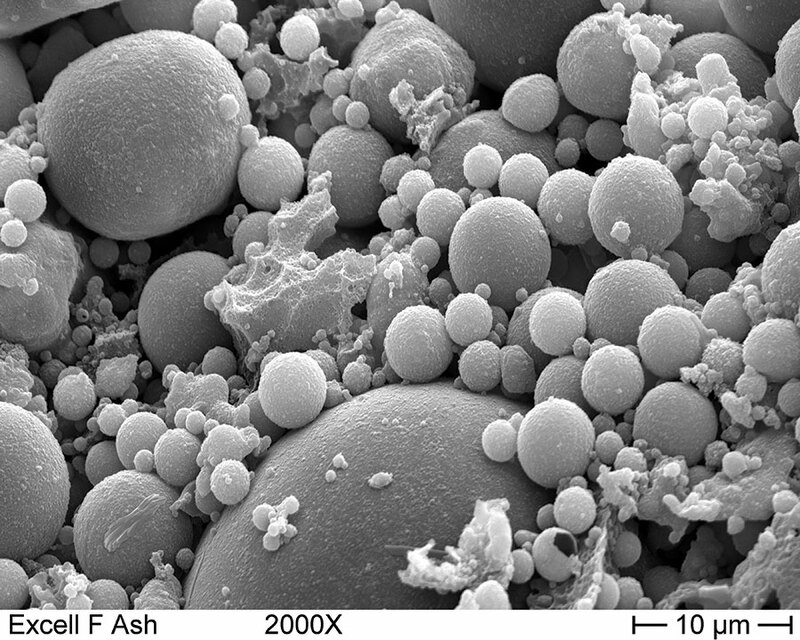 Seen under a microscope, fly ash is finer and more spherical than Portland cement. This creates a lubricating effect that leads to easier pumping and better workability. Jamie Farny, buildings market manager at the Portland Cement Association (PCA), explains some of the reasons specifiers may desire fly ash concrete, “Because of the nature of coal ash, the particles tend to be smaller than portland cement, and seen under a microscope, are spherical,” he says. “It not only makes more cement gel, but this shape creates a lubricating or ball-bearing effect. It basically means easier pumping and better workability.” In some cases, the mix design could use less water while maintaining the desired slump. Farny says water demand could be lowered 1-10% due to lubricating effect, and points out that finer particles lead to less bleed water. The reduction in portland cement also reduces the amount of heat generated during hydration. “This is more pronounced with massive sections,” says Farny, “but could be useful in hot weather.” In the winter, when hydration is already slowed, concrete contractors usually prefer not to use fly ash. Perhaps the biggest difference between regular portland cement and blended fly ash versions is set time. On average, fly ash setting time by about 30 minutes so it may extend the working time as well. 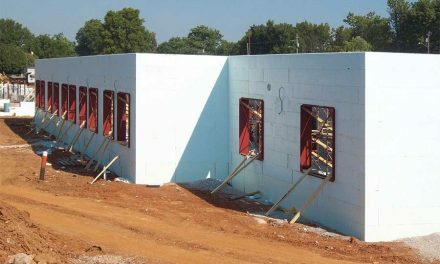 ICF contractors won’t have any problems removing their bracing after the typical 48 hours, but shoring under suspended floors may have to remain in place longer. 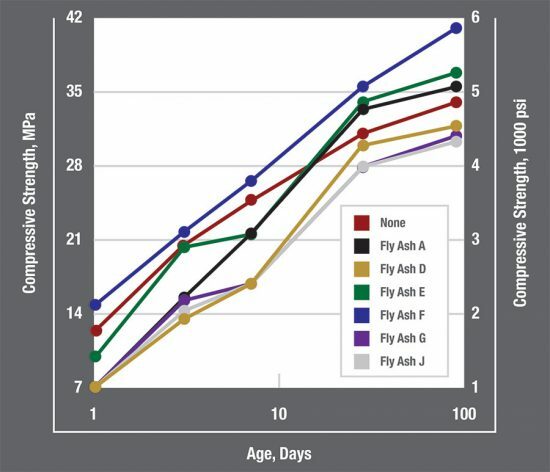 The chart at right indicates the strength gain over time of six different fly ash designs. 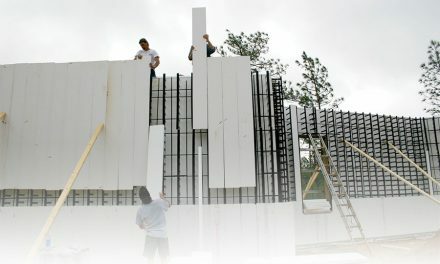 Lemay says, “For ICFs it doesn’t really matter, because you’re setting up really ideal curing conditions for concrete inside the forms, and the immediate strength gains are not as essential as they are with other types of construction. Fly ash concrete typically has better strength at later times, and can create a stronger, less permeable concrete. This chart shows six different fly ash mix designs compared to a pure Portland mix (in red). Part of the difficulty in describing exact performance attributes is due to the variability of fly ash itself. In general, coal mined in the western states yields Type C coal ash, which is more reactive and cementitious. Eastern coal tends to yield Type F, which is more pozzolanic, and reacts more slowly. “You have to do some legwork ahead of time and have a mix design that you understand, as coal ashes vary from one source to another,” Farny says. 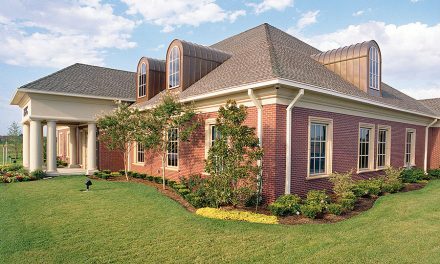 The American Concrete Institute (ACI) has published guidelines for these mixes. A decade ago, they capped fly ash use at 15% of the total cementitious materials in the mix. Today, mix designs with 40% or 50% fly ash are available. The latest research on high-volume fly ash (HVFA) concrete is available from the NRMCA website, and can be downloaded for free. Lemay says that the availability of fly ash is not yet universal, and is usually determined by one’s proximity to coal-fired electrical generation plant that produces fly ash of an acceptable quality. “Usually it moves, via trucks or railcars, to a concrete producer or distribution plant, and that distribution system is not developed nationwide,” he says. As fly ash regains its position as a green alternative to portland cement, the landscape has changed significantly since 2008. Previously, green rating systems such as LEED have offered credit for fly ash concrete under the reuse/recycled material section. However, these credits are being phased out since virtually all building materials already qualify. (More than 95% of steel is recycled, concrete is local, and wood is renewable.) So LEEDv4, which is being phased in over the next nine months, removes most of these credits. Additionally, tighter pollution controls at power plants are changing the chemical composition of fly ash. In some cases, these adaptations may be enough to force the material out of spec. 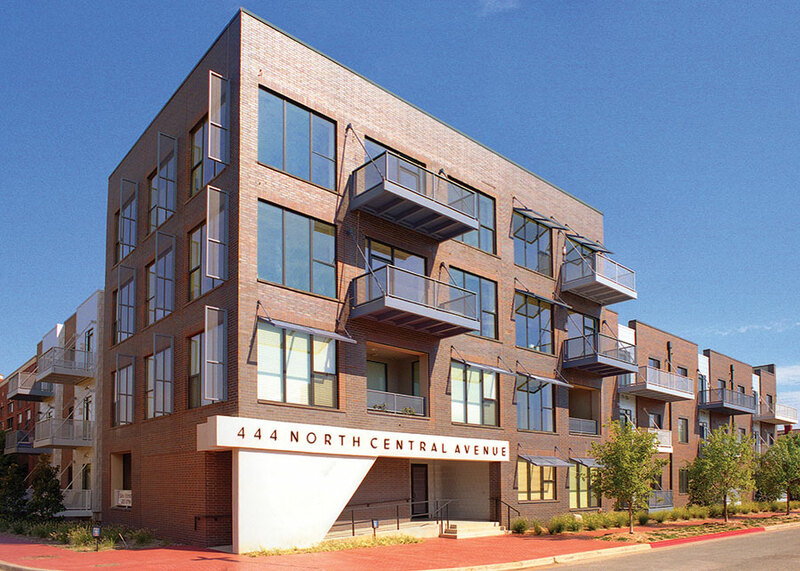 Central Avenue Villas, an award-winning eco-friendly condominium complex in Oklahoma City, also used a combination of fly ash concrete and ICF to form the interior and exterior walls.